There are many great front porch designs from which to choose. It isn't practical to build front porches of different designs on a single home so that you can see their overall effect. So we created a tool you can use to see just that - different front porch designs on the same home to give ideas for your own home. Whether you are building or remodeling a front porch, our very own Front Porch Designs Illustrator allows you to scroll through a set of 3D drawings to actually see how different sizes and styles of porches look on a classic two story home. Follow our steps below to see possibilities for adding a porch to your home - or updating your existing one. 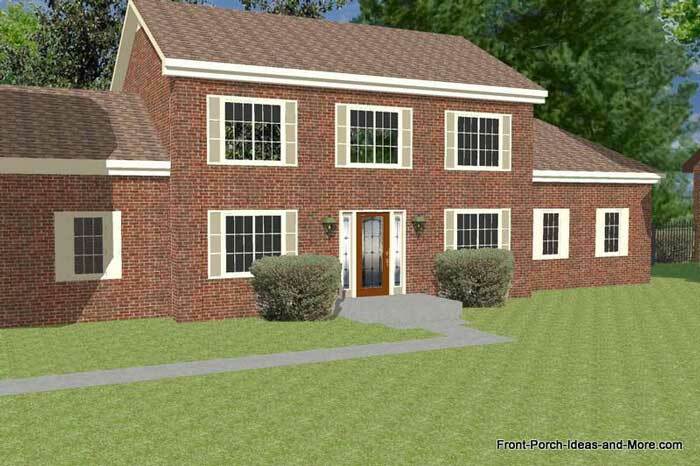 How Would These Homes Look with Front Porches? Do you have a ranch home instead? 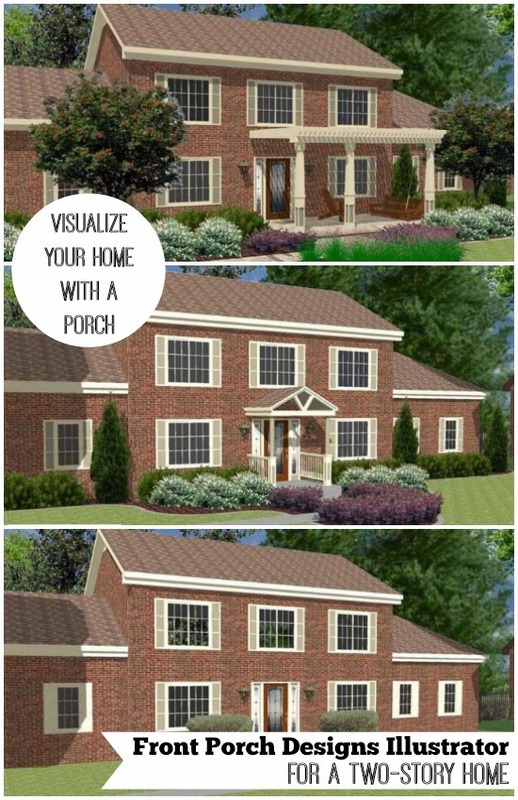 Then use our Ranch Home Illustrator and watch our ranch home's curb appeal change as we change front porch designs. You are sure to be pleasantly surprised! Note: Please view our Porch Illustrator on a full-size screen rather than a mobile device. The detail of the pictures is too small to see on a mobile phone. Thank you! It is not easy to visualize how these homes would look with different styles of porches. But we make it easy for you to see. Follow the steps below. Just click on the "Next" button beneath the large picture below and allow a moment for each picture to load. - We add everything from a small porch roof to a full size front porch ideal for making memories. - We explore different roof styles, porch flooring and walkway options. 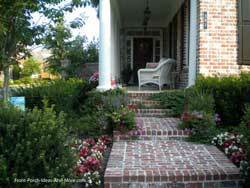 - We also give you many different front porch landscaping ideas too. Note: This page is best viewed on a full sized screen rather than on mobile devices. Thank you! Many of you have asked... if we can show you various porch designs on a two-story home. Now we can and with even more pictures than you see above! 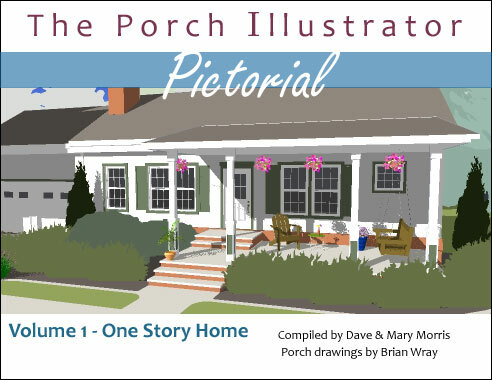 Whether you have a one-story or two-story home, our eBook, the Porch Illustrator, will help you visualize how different porch designs change the look of your home. Our eBook comes in two volumes: Vol 1 is a one-story home (155 pages), Vol 2 is a two-story home (191 pages). You'll get plenty of porch ideas from both volumes no matter your home's style. You will see the porch designs we show you above - but with way more views of each design. Views that are from the street, from the yard, up close, from above and from each side. We tried to cover the bases. We even added amenities and decorated some of the porches just to make it fun. See how you can get it. The two of us chose two of the above porches to give you a much more in-depth look. Using the "next" button below the picture, scroll through the pictures below. You will see the porches from various angles - from the street, from up-close, either side and even from above. We want you to feel as if you're actually there! 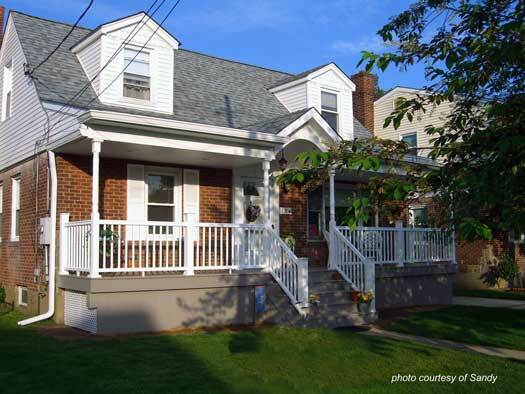 About Porch TS14: A classic two story home with a wonderful full-sized front porch. This inviting porch is topped with a painted ceiling and flat roof. Take note of the square columns and balusters. The entrance is flanked by attractive posts. The porch flooring and walkway are done in random ashlar and the updated front porch landscaping is outlined with cast edging. The size of this porch accommodates two comfortable seating areas. We love the porch swing. Don't you? About Porch TS9: Here you see an off-centered porch on this attractive brick two-story home. The beauty of this design is the pergola-style roof and flat roof combination. The pergola roof allows streams of light on the porch yet gives some shade. The flat roof (with a tray ceiling) provides protection from rain and hot sun at the front door. It's a very pleasing combination, don't you think? This open porch has columns that are square and tapered with square recessed bases. The porch floor and walkway are attractively finished in random ashlar. 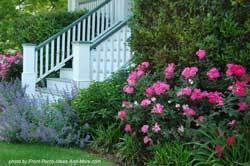 Notice how the porch is fully landscaped with colorful foundation plants. Imagine how different this scene would look without the landscaping. - Our thanks to ricocheting.com for creating the slideshow viewers for showing off our great front porch designs. - Cumberland Landesign created the 3D conceptual drawings you see on this page. They are no longer offering this service. 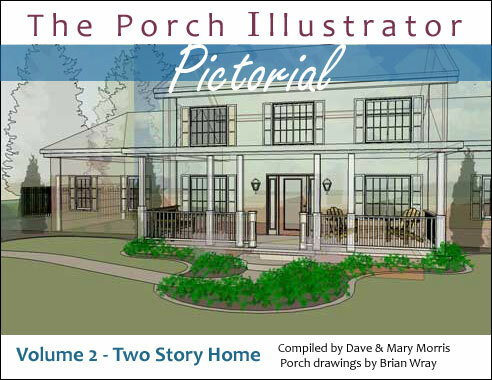 We hope our Porch Illustrator gives you some great front porch design ideas!